The first spoons i made were made from Lime turned on a Pole lathe and hollowed out using Pfeil gouges (beautiful gouges). I am obviously completely sold on axes and knives. But i do admire a lot of traditional carving that has been done with chisels. That said after having a bit of tuition from a world class carver i was very disappointed to see the vast number of different chisels he used, his work was beautiful and he was a skilled man but the number of chisels were too prescriptive (and too expensive) for me. I started using Svante Djarv spoon knives about 10 years ago i think these were either introduced to me by Mike Abbotts books or Ray Mears, i got several bad cuts from them because i didn't know the safe way of using them, cuts from spoon knives can be quite nasty because they cut chunks out rather than nice neat gashes which can close and weld themselves shut like straight knives do. When i was serving Mike Abbotts apprenticeship i met Ben Orford after trying his spoon knives i was amazed at how sharp they were, he also had a slightly flatter design knife that gave a nice smooth finish. Since then i started using Ben's knives and use them on my courses, i find the smaller knives are better for beginners as they do not need to take big cuts. It didn't take long to realise that the big knives were the way forward for making lots of spoons and for giving the very best finish. As i think is often best i tried out what they did in the olden days, let's face it they knew what they were doing in those days and to be honest when it comes to Artisan spoons very few people know what they are talking about these days. I had seen old photos of twca cam's etc and got masses of information from watching Ion Constantin on YouTube. Anyway when i was travelling around i had this large Svante Djarv spoon knife blade that i'd put in a large handle, but i find his bevel angle too fat and i didn't have anything to grind the bevel down with, so then i think i bought a large Ben Orford hook which is similar size and shape to Svante Djarv but has a more acute bevel angle. I am very embarassed to admit i snapped this blade when attempting to fit it into a poorly drilled out mortice (about ten years previous to that i had snapped a Svante Djarv when i put it in a vice and tried to open up the curve a bit (luckily i know more about metal these days!) woops. So then i was at friends in devon who had a belt sander (machines like belt sanders or wetstone grinders are great for sharpening not just because they are quicker but because you do not need to move the blade backwards and forwards this gives much greater control for sharpening particularly reshaping a spoon knife). I ground the angle down considerably and sharpened it, wow what an improvement! the bevel on bent blades can be more acute because the bend puts tension in the blade and prevents edge roll (or something like that). believe me there are as many ways to use and hold a spoon knife as there are with straight knives so don't let anyone tell you their way is the only one. I have been using this long handled spoon knife ever since and have several of my own ways of using it which i will go into more depth on another post. I learnt much after chatting to Rob about how Ion used his spoon knife and a combination of studying YouTube videos and Rob's description of how he used it and using the replica of Ion's knife that Rob made. 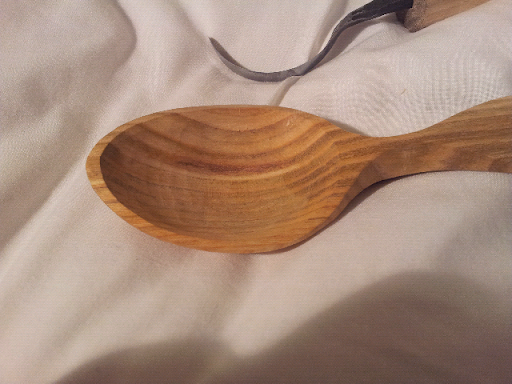 I made much progress in how i felt the future of my spoon carving needed to be. 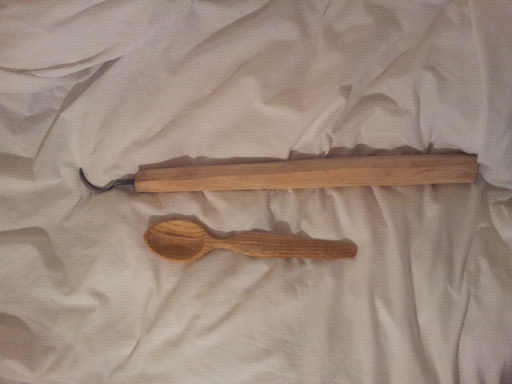 Since then i have made a lot of spoons and i have been getting more and more frustrated with my spoon knife. The main problem for me arises because the blade is asymmetric, this makes it difficult to create a symmetric shape bowl. Like i said there is not just one way of doing things but my future spoon carving lies in symmetrical blades and i have known this for a while. Anyway i finally got around to forging a new blade to my exact designs with Rob, this is the first one i have put a handle on and the photo is the first spoon i made with it. I know i have been waffling on a bit but i am very excited about this, it really is the dawning of a new age of work for me. The ongoing debate between the spooners i respect goes sonmething like this, it appears they all use asymetric blades, Rob has experimented using scrapers inside his bowl which he reckons medieval artisans did and having looked at medieval spoons they do look like they may have been, Jogge sands the inside of his bowls to a very smooth finish. And Fritiof who also was concerned about the asymmetric shape the knives made the bowls does somthing completely different, he leaves grooves in the bowls by doing a series of cuts across the bowl all going with the grain, he comes from two directions and meets in the middle, this leaves a good finish and allows control of the shape of the spoon. 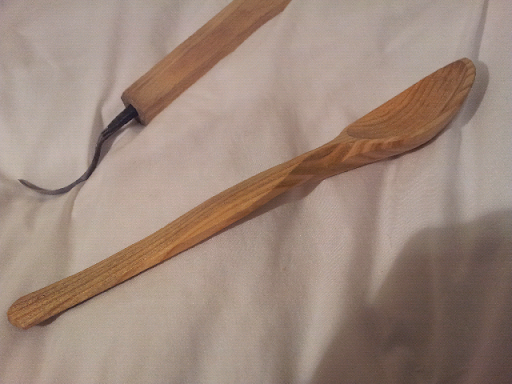 I have seen spoons made by Ben where the cuts leaves grooves working into the centre radially.. All of us do some hollowing with adzes/axes before hand. Anyway, i know i waffled on there, there is just so much to say about these things, but i need to get going with work now. This spoon is a special one and therefore the price is more than normal. Yesterday was a brilliant day, not least because it looks like Spoon fest is getting some legs.